Everyone has a different encounter in their love life. Even so, the most powerful love is the one where both parties are looking in the same direction of life. There is no way love can grow in an environment where the couples are looking at different things. This brings disunity in the foundation of love. Two people need to travel in the same direction for their love to work out or else they will have frictions in their midst. A unity of purpose in love is vital for every foundation of love, and it can only come when the two parties are looking at the same things. This is the best truth about being in love. When you are gazing at each other, you both have an opportunity to stare at each other’s past and seeing different things. But when you are looking outward with your spouse and in the same direction, you will both be looking into the future and leaving your past behind. What do you choose? Have a unity of vision in love and learn to see and walk towards the same things. This will make your love foundation very strong and stable. It will bring unity in your relationship and leave no room for disunity. The unity of vision in love is very crucial. Every couple needs to look at the right things together. It will not help when each person is looking at the right thing, but they are divided in their vision. Everyone will come back with what they think is right for the relationship and this will cause friction between the two. As everyone looks in the different direction, they will see the best of life in that direction, and it will be difficult to convince them that the direction you were looking at has the best. Since you may not want to move to a direction your spouse does not like, and you cannot move in your direction and leave them, you will remain at the same place. You must have a unity of vision in love, and this is fundamental. While looking outward together will earn you the best results in a relation, you have to have a definite target of what you are looking at. You may be looking towards the same direction but looking at different things. As you strive to establish unity of purpose in love, identify a specific target for the both of you to look at. Look at plans on how to own a home together, how to get into business together, how to start a family together, and so on. Have specific goals in place that will guide your vision and keep you in check. I have lived a long time to prove this true. For a relationship to move forward, there must be a unity of purpose in love, and common goals to achieve. People can only grow closer when they walk in the same path. If they are on different paths, they will grow apart. 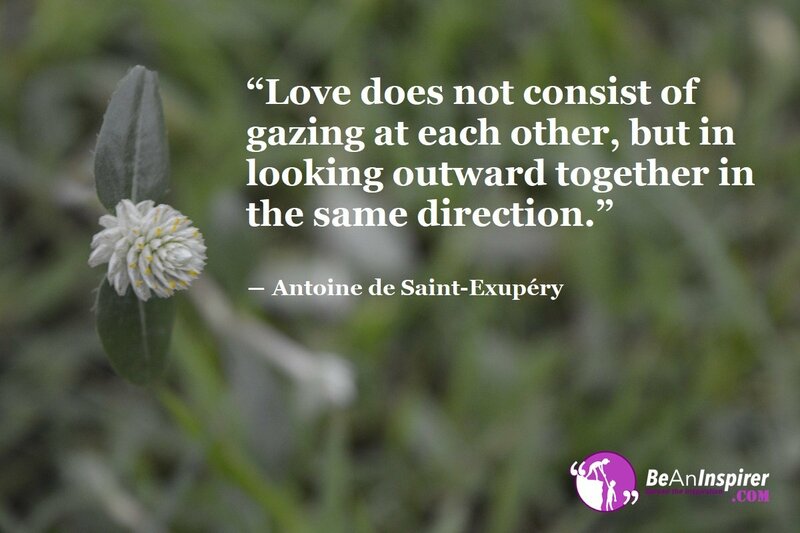 Learn to look outwards together with your spouse and in the same direction; look at the world together.